In this article, I will explain how an agarose gel works to separate nucleic acids during electrophoresis. Also, I will discuss how to select the correct percentage gel for your needs. 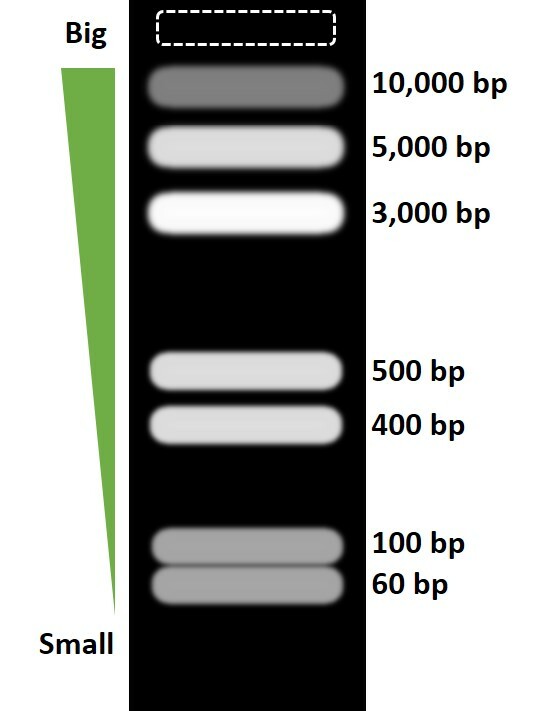 Agarose gel electrophoresis is a technique used to separate nucleic acids, usually linear DNA, based on their size. Briefly, samples are loaded into an agarose gel, containing an intercalating dye, within an electrophoresis tank. An electric current is then applied to slowly force the molecules through the gel. By doing so, smaller molecules migrate faster than larger ones, and so different sized fragments will start to resolve. A perfect example of this is by looking at how a DNA ladder looks after electrophoresis. Refer to the example below showing the separation of differently sized products. Since the gel contains a dye, the bands can be visualised in a UV transilluminator. But, how do agarose gels achieve this fragment separation? Next, I will explain the concept behind the way agarose gel electrophoresis works. When set, an agarose gel will form a complex polysaccharide matrix. You can think of this matrix as a cheese grater (stay with me) which provides resistance against nucleic acid molecules. Taking the cheese grater analogy, if you want large pieces of grated cheese you would use a grater with larger holes in it. On the other hand, if you only want tiny pieces of cheese shavings you would use a grater with very fine holes. This same concept occurs within the agarose gel matrix. The higher the concentration of agarose within the gel, the smaller the pores within the matrix (or holes in a cheese grater). These smaller pores make it difficult for larges molecules to migrate through the gel and so they favour the smaller fragments in the sample. Conversely, lower concentration agarose gels have larger pores which allow the separation of larger fragments easily. So, when a current is applied through the gel during electrophoresis, the nucleic acids migrate through the pores and are separated based on their molecular size. It is the size of these pores which ultimately decides the molecule sizes can pass through the agarose gel. What percentage agarose to use? When thinking about the percentage of agarose to use in the gel, it is important to understand your resolution needs. What this means is that the concentration of agarose should be able to separate your desired fragment size enough so that it is identifiable. Take the example figure below of an artificial agarose gel comparison between a 1.00% and 2.00% gel. 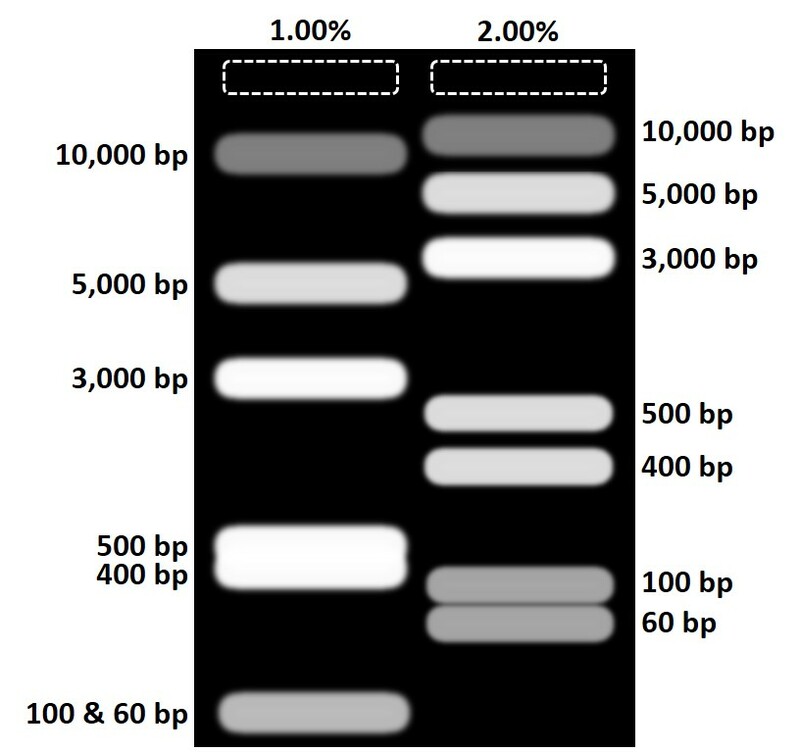 Notice that a 1.00% gel did not separate (resolve) the two bands at 400 bp and 500 bp that well, and the last bands did not separate at all (100 bp and 60 bp). Now when running the same samples on a 2.00% gel, the resolution was increased whereby these smaller bands are now seen as distinct products. To help decide what percentage of agarose to use, I have included a reference table below containing different agarose gel concentrations, along with the corresponding resolution sizes (adapted from Thermo Fisher). To use the table, look at the Resolution column and identify the range which includes your molecular size of interest. For example, if I want to separate a 100 bp product from a 1,500 product on a gel, I would select the 2.00% agarose gel since the resolution is between 50 – 2,000 bp. If there are a wide range of sizes to be separated on a gel, it is recommended to start with a 1.20% agarose gel concentration. Resolving fragments which have a similar size can be tricky to do on agarose gels. For example, a 30 bp difference in size between two fragments. But, there are a few tricks you can do to help with this. Use a high percentage agarose gel. Between 2.00% and 3.00% should help. Higher concentration gels have a better resolving power. Create a larger agarose gel. If the gel is longer, this means the samples can be run for longer without them running off into the abyss. Longer runs mean better separation. Run the electrophoresis slowly for longer. This will ensure the bands are clean and sharp. By running a gel on a high voltage can causing smearing of bands. Use a polyacrylamide gel instead. Polyacrylamide gels have superior resolving capabilities (down to 10 bp! ), compared to agarose gels.